We are a 2nd generation family run independent business. The company was founded in 1974 by Andy Besant. 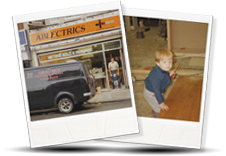 After working as an electrician he opened up Ablectrics as an electrical wholesalers. Now over 40 years later the business is being run by his son Fraser. We now also specialize in lighting and offer a great choice of products from leading lighting suppliers from all over the world. We have a lighting showroom and a great website delivering our famous service and affordable pricing to customers all over the UK. We also offer a lighting design service to our customers and we restore, customize and sell genuine vintage lighting. We have offered our design service to clients on Grand designs, the Hilton Hotel Chain, Marco Pierre’s restaurants and the Boston Tea party coffee shops to name but a few. Our efforts to provide great customer service have been nationally recognized and in 2015 we won an award for the UK best independent electrical wholesalers. Our dedication to online security is underpinned by the payment options we have available. From Paypal to SagePay, trusted and safe online companies whom we work with. Checkout quickly and securely using Sagepay. Pay with a debit or credit card and enjoy a quick and easy checkout. Checkout As A Guest or with your Paypal account, using the secure Paypal payment server.